MRSA, or Methicillin-resistant Staphylococcus aureus, is a type of staph bacteria that is resistant to antibiotics. 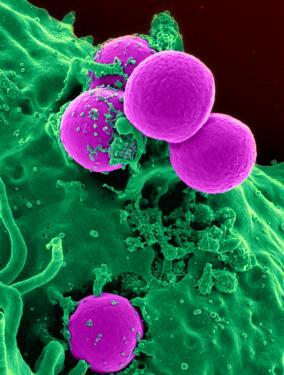 MRSA is a strain of staph, a common bacteria that one third of people carry without being infected. Staph can be treated by antibiotics, but since MRSA is antibiotic-resistant, treatment is much more difficult. MRSA bacteria cause infections that can affect different parts of the body, but most often causes infections on the skin, like boils and sores. MRSA skin infections typically start out as small red bumps, but may turn into deeper abscesses. MRSA may cause more serious infections as well, like infections of surgical wounds, the bloodstream, the lungs, or the urinary tract. For these types of infections, the symptoms of MRSA may be different. Although MRSA is resistant to most antibiotics, it isn’t untreatable. In fact, some antibiotics still work, and scientists and continuing to discover new ways to treat MRSA infections. MRSA can present diagnostic problems because doctors may believe that a patient is not suffering from a staph infection when antibiotics do not appear to be helping the problem. It can then be too late to treat the patient effectively with one of the few antibiotics that can combat MRSA, such as vancomycin, linezolid, or daptomycin. Sometimes antibiotics aren’t even necessary to treat MRSA. Your doctor may be able to simply drain the infection. However, any site that continues to harbor MRSA and is not adequately treated by antibiotic therapy should be considered for surgical intervention. The first step in preventing the spread of a MRSA infection and other antibiotic-resistant bacteria is maintaining good hygiene. By washing your hands frequently with soap and water, you help prevent disease, which means you won’t need antibiotics. This will also help you follow a good rule of thumb: Only take antibiotics when they are absolutely necessary. If you think you have a skin infection, the best thing you can do is clean and cover the area, wash your hands, and visit a FastMed Urgent Care near you for treatment.